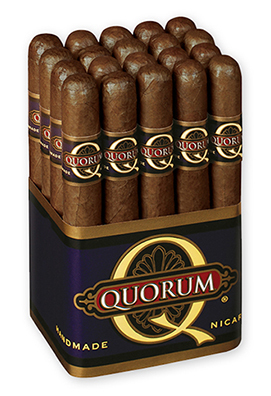 Quorum is a great mild- to medium-bodied cigar for the smoker who enjoys a nice everyday smoke that won't break the bank. Handmade by J.C. Newman & Company using Nicaraguan fillers and binders and an Ecuador-Sumatra wrapper, the tasty Quorum "classic" line quickly grew in popularity and is now joined by Quorum Maduro and Quorum Shade. These are the cigars you'll grab on the way out the door because they're smooth, enjoyable, and priced to smoke at the drop of a hat.